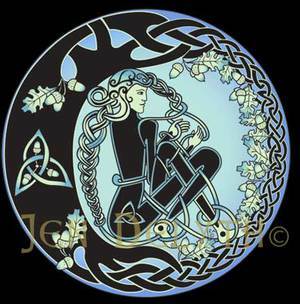 The Celtic Tree of Life represents the mysticism of the old Religion, in which the trees, the creatures and the land are a strong and vital force, connecting the folk within a living universe. The Folk-Soul is supported within the Tree of Life, which represents the interconnection of all living things. The oak is particularly revered by the Druids whose name is related to “duir” the Celtic name for the “oak” and “door” – the opening to the Mysteries. Dryads are the Wood nymphs of Greek mythology –the Spirits of the Oak Tree.